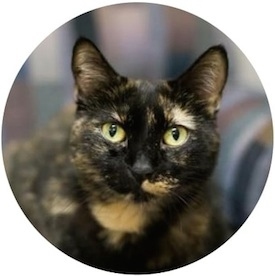 Star is a very cute round-eyed 8 year old Tortie with a large personality. She likes to act very silly at times, racing around the room pretending to be chased, but soon comes back to you for cuddles. She likes to be petted and gives you lots of kisses, but sometimes sudden movements scare her and she will nip at you softly. However, right after she will snuggle up and be cute as a button again. Star will wait for you when you come home and prefers to sleep next to you, wherever you are in the house. She would do best in a home without little kids and with a parent that loves her and is patient. Star now lives with Maverick (another foster cat) in her foster home and, even though they don’t like each other very much, she should be fine with another cat in the house.